Is The Inner Healing Movement in Lithuania a Local Religious Response to the Cultural Trauma of Socialism? AR VIDINIO IŠGYDYMO JUDĖJIMĄ LIETUVOJE GALIMA VERTINTI KAIP VIETINĮ ATSAKĄ Į POSOCIALIZMO KULTŪRINĘ TRAUMĄ? Ar Marshall McLuhan medijų teorija turėjo įtakos Katalikų Bažnyčios požiūrio į visuomenės komunikavimo priemones formavimuisi? HAS MARSHALL MCLUHAN'S MEDIA THEORY INFLUENCED THE FORMATION OF THE CATHOLIC CHURCH'S APPROACH TO CONCEPTION OF THE MEANS OF SOCIAL COMMUNICATION? Scientific Magazine has been published since 1924 by Faculty of Theology-Philosophy at Vytautas Magnus University and renewed in 1999 by Faculty of Catholic Theology at Vytautas Magnus University. Peer reviewed, 4 annual volumes are published in Lithuanian, English, German, French, Italian, Polish and Russian languages. Sections of the journal: Theology and Philosophy, History of Church, Canon Law and Social Teaching of Church, Christian Culture and Religious Studies, Christian Education and Psychology, Archive. Sources. 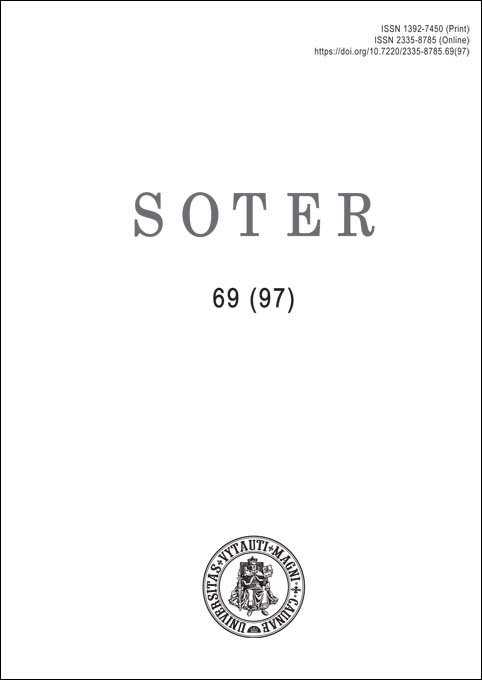 The are no author processing charges or submission fees for publishing in Soter. The Magazine is supervised by the Chancellor of the Faculty of Catholic Theology at Vytautas Magnus University, the Archbishop Metropolitan Lionginas Virbalas SJ. Journal is funded by the European Social Fund resources allocated for the project Publishing and coordinating periodical scientific publications within the framework of the Operational Programme for the European Union Funds Investments in 2014–2020.